Online retailer discounts Samsung's flagship yet-again ahead of the smartphones 11 April global release. 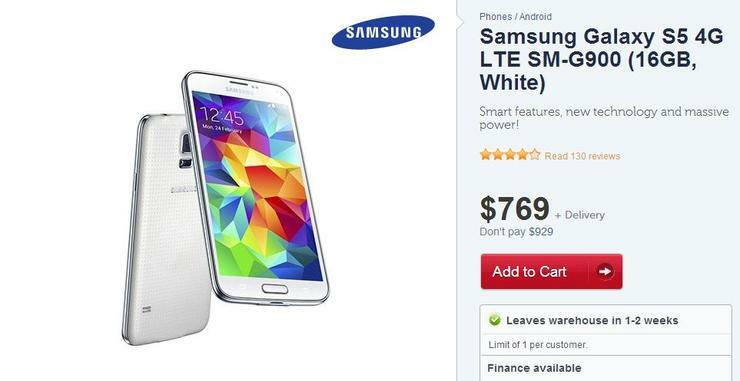 Samsung recommends Australian retailers price the Galaxy S5 at $929. Pre-ordering the 4G smartphone from Kogan yesterday would have set you back $849, a saving of $80. Ordering today will see you pay even less as the rampant discounter dropped the price of the 4G Galaxy S5 to $769, which undercuts the recommended retail price by $160. Delivery times are estimated as between 1-2 weeks. Samsung will officially launch the S5 on 11 April. Kogan is selling two versions of the Galaxy S5: the version Samsung is officially launching in Australia, which will feature a quad-core CPU and compatibility with Australian 4G networks, and the international eight-core variant that supports networks up to 3G. As far as Good Gear Guide can tell, the $769 Galaxy S5 Kogan is selling is identical to the official S5 being released in Australia by Samsung. The eight-core version is still being sold for $799, as advertised at the time of writing. We can't predict what prices will do in the future as there are many factors involved. The online retailer has a history of quickly revoking heavily discounted smartphones. Kogan previously offered the Galaxy S4 for $430 (including shipping) in September of 2013. After verifying the pricing was correct via its official Twitter account, the retailer rescinded the promotion and offered disgruntled customers a credit.